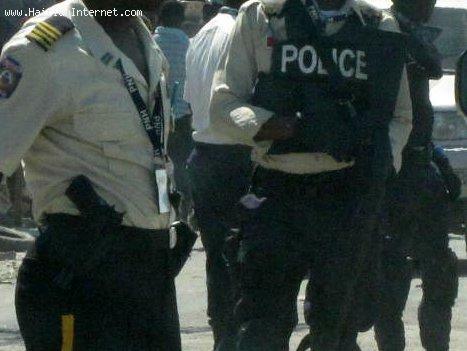 Second Haitian policeman dead in less then five hours -- Another Haitian police officer, Mathieu Johnny, has just been shot and killed in Port-au-Prince today. Only five hours after the death of inspector Yves Michel Bellefleur near Gerald Bataille in delmas 33, officer Mathieu Johnny was murdered in downtown Port-au-Prince, in Rue des Ramparts, a news reporter says. Port-au-Prince Metro Police (DDO) tweets: "Mathieu Johnny, policier affecté à la Circulation vient d'être tué par balles à hauteur du blvd. JJD non loin du poste de St Joseph"
« Cap-Haitien Haiti - Heavy Rainfall, Flooding - 10 People Dead! Im sorry 4 your loss; But! sé ti vicieux yo yé. Bellfleure sé té yon nèg ki té kon ap extorting moun anmpil sou route delmas. This is my blood cousin. WTF is going on with these people? The country needs a breather. They are conspiring to keep the country in its current state, simply because it benefits them, the few. I mean, do they think about the people at all?